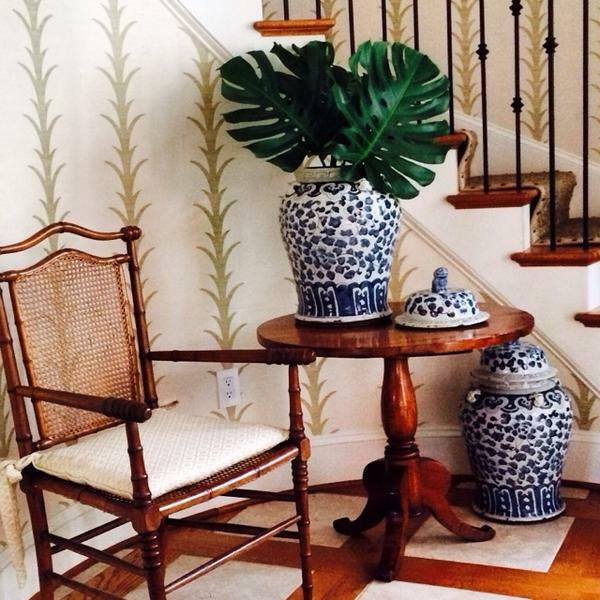 A delightful vignette from Lucas/Eilers Design via Twitter from a home on Kiawah Island featuring Acanthus Stripe wallpaper from Celerie Kemble for Schumacher. Where would you begin here? I'm at a bit of a loss...the wallpaper is incredibly fantastic but can we talk about the patterned floor? And all of the rich wood tones? And of course the beautiful pottery that looks absolutely perfect here. I would be quite pleased if this was the entry of my lowcountry home. Fall is in full swing and we might attempt a pumpkin patch this weekend. Hope you have a great one...see you next week! Wonderful and I also love the deep green palm fronds in the blue and white jar!